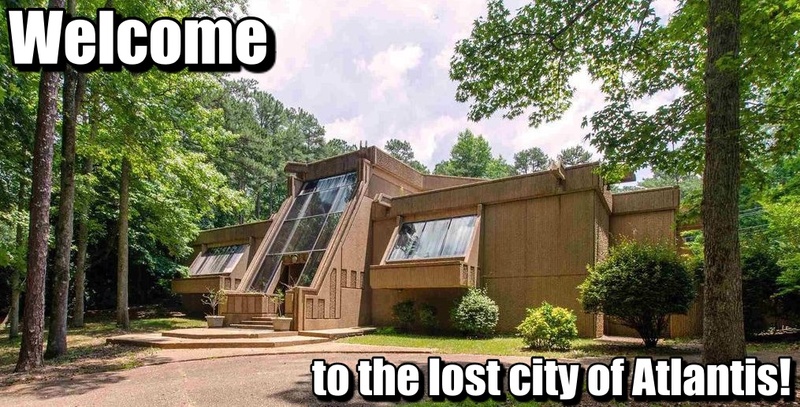 If you’ve ever longed to live in a home that resembles a movie set or something out of Aquaman’s fabled lost city of Atlantis, then this Newnan, Georgia home could be the one for you (*Jason Momoa not included). Boasting five-bedrooms, six-bathrooms and over 3,700 fabulous square feet of unique living space to call your own, this home has it all — including not one, but two swimming pools. The property even has an “extra deep” oversized garage with tall ceilings that are ideal for installing lifts to accommodate up to eight vehicles. Sterling amenities aside, what makes this home truly extraordinary is its “unique concrete and stone structure.” Truly, it has “movie industry appeal” — as long as the movie is set on some Atlantisian-type planet. The sloped stone and glass entryway are the first signs that you’re in for a real treat with this home. Light a couple of Tiki torches, and your front door is now the perfect setting for an Aquaman spin-off. Entering the home, there’s plenty of natural light to be found — thanks to the oversized windows in the entryway. The stone walls feature designer-style etchings, which look like someone dragged an oversized fork in wet concrete and called it art. The ceilings also feature some pretty gnarly “carvings” as well. In addition to high ceiling heights, the home has copious depictions of the sun — found everywhere from the walls to the fireplace surround. 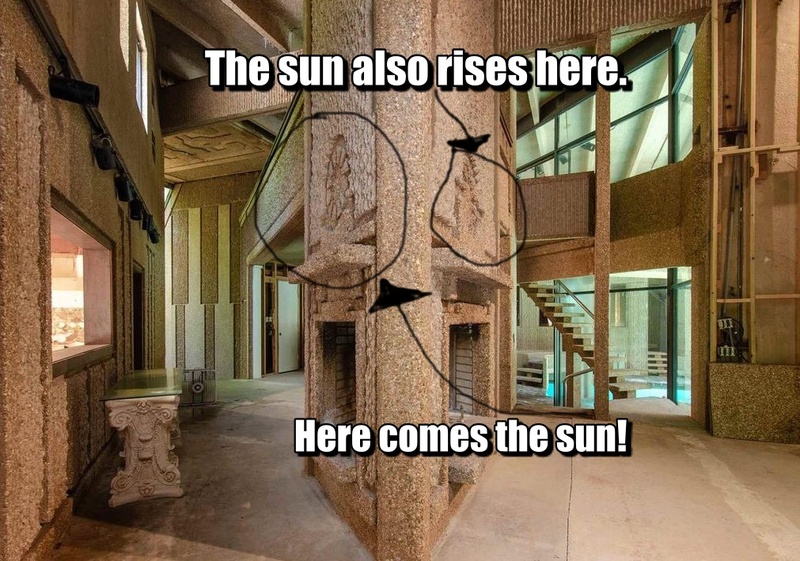 There are also pillars galore, if that’s your thing. 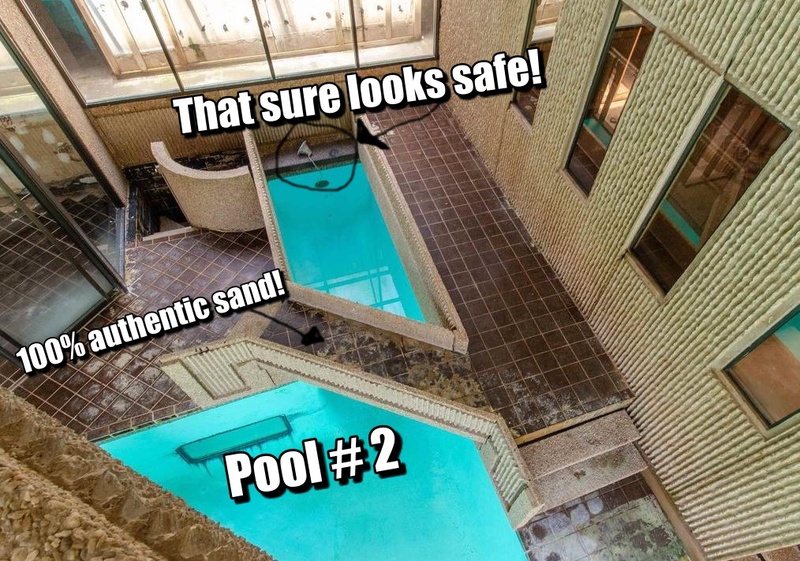 The pools do not disappoint, designed in the same gaudy overwrought style as the rest of the home. 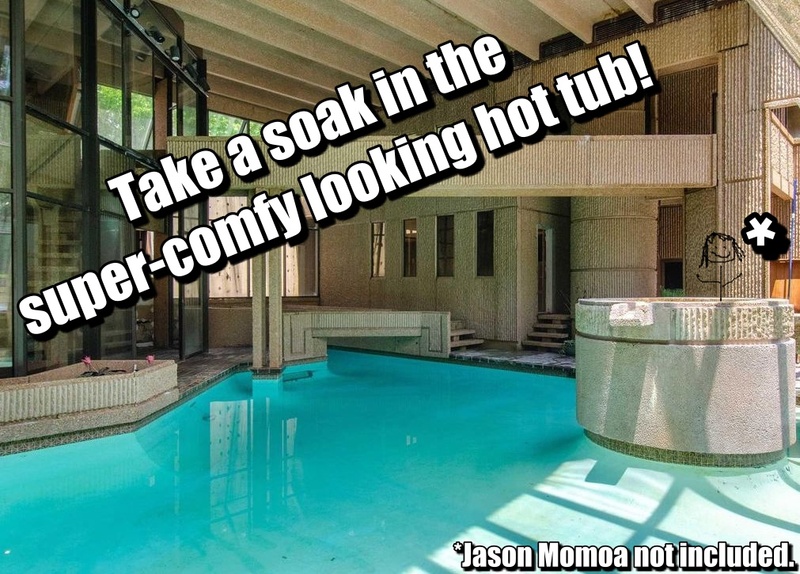 Stone stairs lead in and out of the water, and there’s even a coordinating hot tub smack in the middle of one of the pools that looks about as comfy as taking a nap on a bed of nails — although a soak with Jason Momoa would go a long way at making the hot tub more attractive, to say the least. 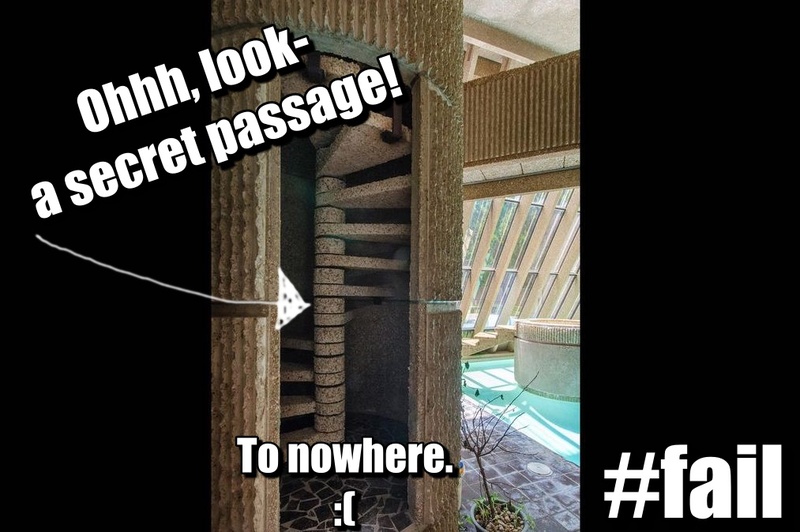 The home’s coup de gras is a secret-style passage that looks fresh out of an episode of Scooby Doo, Where Are You and leads nowhere particularly interesting. 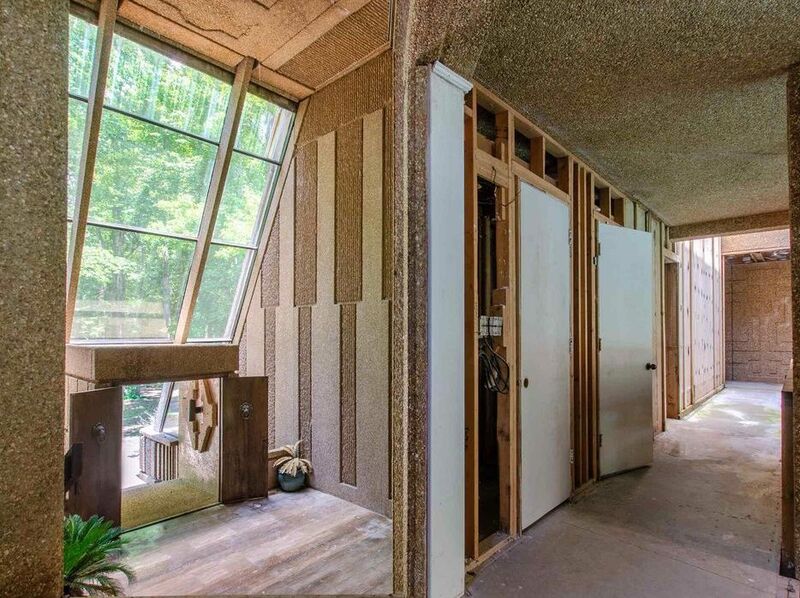 The home is bargain at $299,999, and although the listing claims it was built in 1979 — which might explain a lot — much of the listing’s photos show the home in a state of construction or at the very least a heavy renovation. But, why mess with perfection?